Historically: staffs as totems of power are as ancient as civilization itself, used by powerful pagan shaman to direct their spirit magic. They still remain in British folk dance but have diminished to be no more than the Morris Dance leader's staff of office. In myth and tale: only White Wizards and White Witches of great and goodly power could master a Staff of Magic. If they were not good of heart the Staff of Power would turn them to evil, twisting their outer form into the ugly being that was within. Historically: the lance was the first weapon of the medieval knight. He would ride headlong at his enemy with his lance at a tilt so that it pointed directly in front of his Warhorse. To ride in this way demanded great courage, but to stand before a charging knight required even more. In myth and tale: questing champions would often come to the aid of people in great fear of some huge evil beast (Sir George defeating the red dragon to save the maid of innocence was but one such champion). Remember not all dragons were bad; Puff was a dragon who lived by the sea, ate fish and loved the company of children. Note: this lance is only to be used against evil monsters in the guise of old boxes and only with adult permission. Never ride a bike with this toy, use either a hobbyhorse or imaginary mount! Historically; this toy has changed little from the household tool that inspired it. 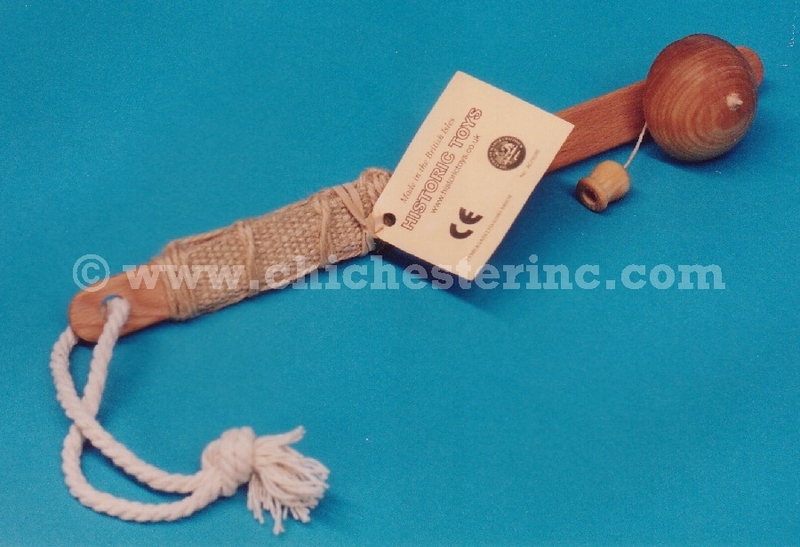 The drop spindle was used to weigh down wool as it was teased, the spindle spun and the wool became yarn. With little doubt spindle tops were first made from broken drop spindles. Just hold the handle, pull the string and watch it go.